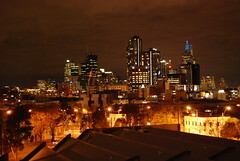 DavisDoesDownUnder: Melbourne ho! ... and some pics from the first day there. Melbourne ho! ... and some pics from the first day there. Ok, so excuse the possibly excessive loading time. 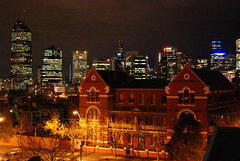 I decided to just drop a set of pictures I have taken, somewhat documenting my journey to Melbourne. By the way, the Virgin Australia airline is crazy! Their 777 (I think) had mood-lights, music in their check-in area, courteous staff, and just felt really hip. And I feel mega-lame for saying the word hip. It's like 4:16AM, been up for a while, couldn't sleep, but I did go to be around like 9:30. Anyways, here are some pics. Actually, I am going to sleep, I'll finish the post later. Ok back, its like 8AM now. I have had a lot of apprehension on going here. I think I need to move from the hostel. Things are pretty expensive around here. I kinda just want to get settled first. Anyways, here are some pics! Ah, so what we have here is a bag full of clothes, an extra pair of shoes, a towel, bowl, spoon, container, Dr. Happy Stein, and some other stuff. And in the MRD bag, yeah, N-SA style, we have a notebook and camera. 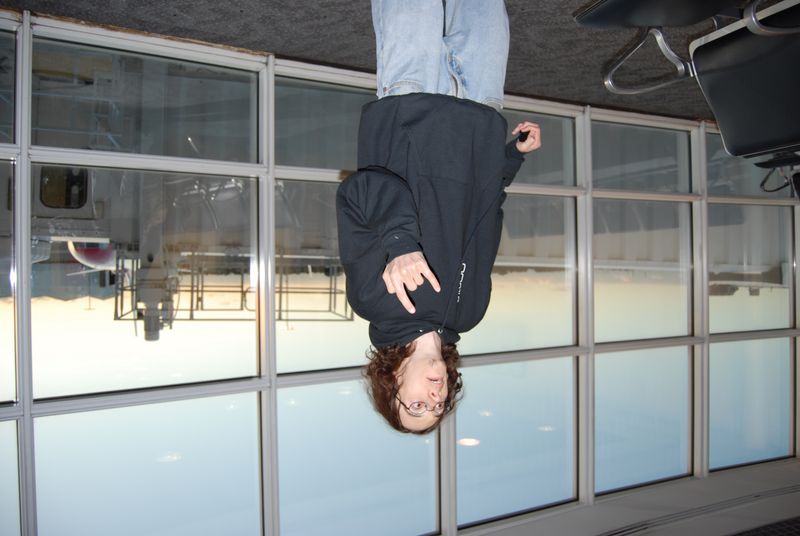 Well the camera was in my hands, but it rested in there on the flights. This dude sat next to me from Charlotte to LAX. His name is Cameron, and he was once from Australia. He now lives in New Zealand (where he is off to), and researches molecular biology. Really cool dude, and he listens to Slayer! Not to mention he had strong encouragement for me on going to Melbourne. He might be one of the reasons I have not yet chickened-out yet. But he told me something that is of utmost importance, and stemming from Buddhist philosophy. Never worry, because if there is a solution, it will present itself. If there is no solution, it will obviously not present itself, and thus there is nothing you can do about such. So worrying is pointless. Dan! Artist who has done work for Mattel and Disney. He is now trying to throw-together a political satire piece. He is from L.A. and is freakin' awesome. Both he, and Cameron, were strong encouragement for me to go. And he said something quite warming. A parent's role is to dust off their kids, if they ever need help. I should never feel guilty if I need to approach my parents for financing. One of his sons is a physics researcher. I have arrived in the Southern Hemisphere! Me and Mike. Discovered him in my room at the Hostel. From South Korea. Really nice guy. My bunk at the hostel. 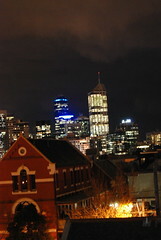 Melbourne Central Business District, taken from the roof of the hostel. Buddhists are such lazy people, they expect the solutions to just come to them. I feel like you should earn the solutions to life or they weren't worth attaining. Right now you are earning what you get out of life and you should have no regrets. But, here is a Buddhist quote that I think is worth it's character space. "To keep the body in good health is a duty... otherwise we shall not be able to keep our mind strong and clear." I seen this girlie that I knew, she was a cutie and Yo! Kyle, bro, thanks for the words! I have my up and down times here. Times I want to go home to be secure, and other times I look forward to securing a room out here and enjoying the culture. The hostel people are not too bad. Lots of nice people around. 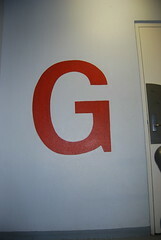 But many of the people at the hostel are transient, meaning they are only here short term. Likewise, I hope I am here short term, as I really want to find a place soon! And to continue: "Moanin' and groainin' like she could take on the A-Team"
Well bro, its killer to hear from ya.